For many homeowners, picking the perfect paint color is a daunting task - prone to error, causing arguments, piling up receipts for samples or do-overs, and sometimes resulting in the decision to "just give up and paint it white". This is why I include paint color selection as a part of my architectural services. Having done this many times before, I make it easy and fun for my clients. A lot of men are color blind. One of every ten men have some form of color blindness, while women are rarely affected. There are different severities and types of color-blindness. The most common type is the inability to distinguish red and green. This can be very challenging when looking at various shades of paint colors, as often the only difference between two colors will be the amount of red or green undertone. "The contractor said he has a white that they used before, so we'll just use that." "We don't want any color, just an off-white." "My mother says we should use antique white." Complex colors change in different light. Many of the popular brands of paints have a complex color base. This makes the color very rich, whether light or dark. It also affects the color's appearance in different types of light. When you select colors, you should look at them in the type and intensity of light they will be seen in. DO NOT pick your paint colors on the floor of a fluorescent-lit showroom. The trickiest colors are green, khaki, and grey. In my experience, the colors that appear the most different according to the quality and type of light are green, khaki (or camel) and grey. When I select one of these colors, I pull as many samples out of the oversize fan as I can find and pin them all up, either in the intended location or in the closest facsimile of the environment. I look at them several times throughout the day as the light changes, and remove any chip that begins to take on the appearance of another color. Green will tend to shift to brown. Khaki will tend to shift toward either purple or green. Grey will tend to shift to purple or blue. Color looks more intense on ceilings. 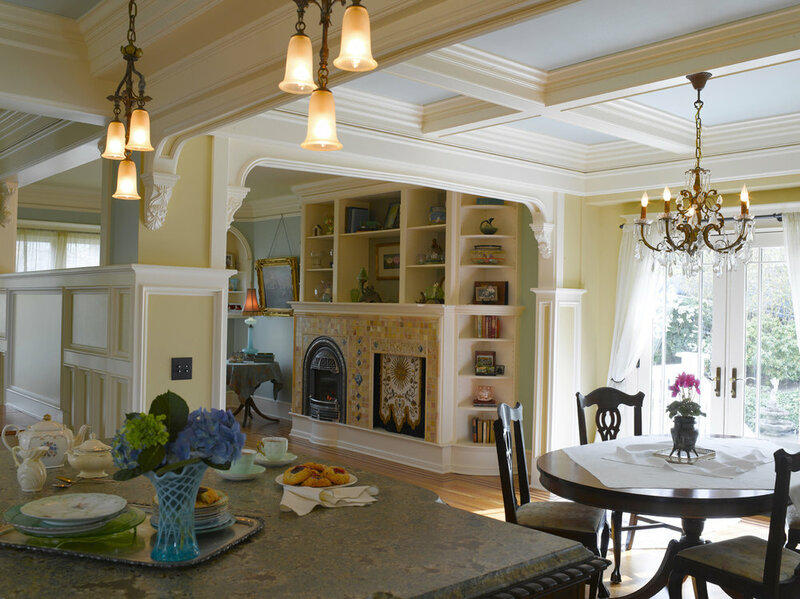 A paint chip with a hint of color will take on the appearance of a strong color when painted on a ceiling. The blue on this ceiling is actually a white with the slightest hint of blue hue that makes it look blue next to the creamy white trim. Exterior house colors always look lighter than expected. Selecting exterior house colors is one of the most challenging tasks. Nearly everyone who has chosen their own exterior paint will tell you they wish they'd gone darker. The sun is an incredibly powerful light source, even in the Pacific Northwest, and it affects the appearance of color dramatically. In fact, exterior paint always looks significantly lighter than the swatch once on your house. When you are choosing exterior colors, you should be looking at the darkest colors in the range. If you there is a house in your neighborhood you like, it is well worth knocking on the door to ask what color they used or to ask permission to bring your paint fan with you to compare swatches with their house. Avoid trendy colors. The retailers have a knack for rotating color trends, and today's beautiful green will soon be dated. The exception to this rule is choosing a color that is currently "trendy" but is one that you have ALWAYS loved. If you have loved it your entire life, you probably always will. If it is a new color that you are enjoying, have fun with your towels, bedcovers, or rugs. It is easier to rotate those when you become sick of the color than it is to repaint the room. Question the accent wall idea. My theory is that if you want a color but only on one wall, you probably aren't convinced that you like the color - or that you will like it for very long. Here is another opportunity for tablecloths, rugs, towels, etc. to take on that role. A true accent wall uses a contrasting or more saturated color to emphasize the architectural features of a space, not to showcase a fad. Ask for help. I bring every Benjamin Moore and Sherwin Williams color created into my client's homes, sparing them the confusion at the paint counter. 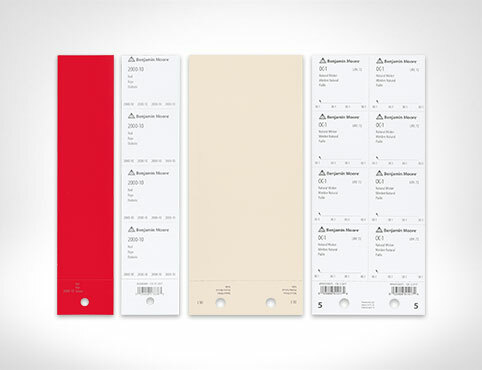 Rather than looking at tiny strips of five or six shades, we look larger swatches of individual colors. My paint kit is organized by the amount of undertone in each color, so it is easy to predict which colors will tend toward red, green, blue, or purple, based upon where the color is located within the stack of each color. I leave these swatches with my clients and order replacements for my kit. If you don't have access to a professional who uses this kit, you will want to order fan decks so that you have lots of options to view in your home. Test it out. After my clients have had some time to look at the color swatches in various lighting over a few days, we select a few to mock-up on the wall. We don't use the little paint pots or pouches unless they are the exact brand AND sheen we intend to use, since both of these factors affect the color's appearance. We normally have mock-ups painted in 12"x12" or 24"x24" squares, in both the brightest and darkest spots of the room. If you'd rather not put the samples directly on your wall, you can paint the samples onto large pieces of foam core to help you visualize. Join the conversation. Have you used these tips to select the perfect paint color for you space? Comment to tell us about your challenge and what color you ended up using.